News, news, news: May finished and June started with some great news about Route. This month instead of creating new features, we decided to turn our feature set better! This month our product updates will be all about improving what we already offer. I know, you’re busy with you daily chores, but I’d really suggest you to spend a minute reading this post about all the news things we are offering. We’ve made several updates in our website and FAQ/documentation. We updated our FAQ/Help with new information about the latest product updates. We think it can help you use our features and enjoy Route at maximum. If you didn’t visited our Help page yet, click here and take a look. There you’ll find everything you can do with Route. We are not an analytics tool, like Google Analytics or Mixpanel. But, we know that tracking more broad behavior like, for example, visiting a specific page. Pageviews are important for marketing and sales automation because I’m sure there are some pages of your website you consider important and would like to take some action when someone visits it. Here in Route we track pageviews for our Pricing and Integrations page. It show us who are more interested in learning more about Route and we can use this information to create automated campaigns. 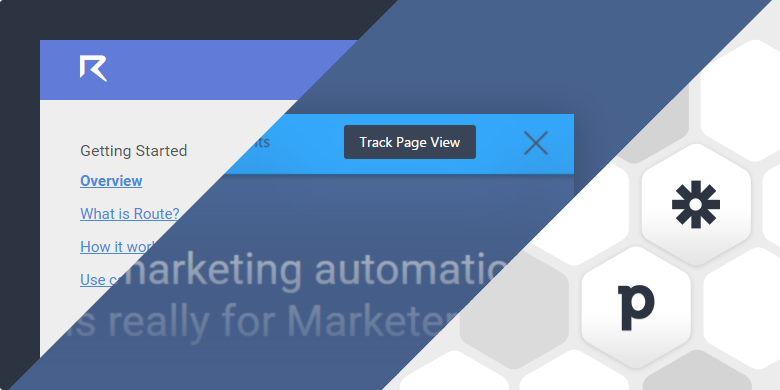 Our Visual Mode now has a “Track Pageview” button, so you can track when someone visits a specific page you started tracking. With this new event fired by your users, is easier to understand their behavior and prepare high-converting campaigns. The pageview information can be used as a filter in searches, as a condition in automations and even as an information you use in the body of an email you create. In our last news we spread the word about our Event Attributes feature. Now, you can attach to events their attributes when sending to Route data from Zapier and Pipedrive. If you use these services, we really recommend you to start using this feature. If you use these services, we really recommend you to start using this feature. If you use our Pipedrive integration, event attributes will come automatically in your new Pipedrive events (since last week), like pipeline stage, deal status, deal value and much more. And if you use Zapier, you’ll find a new field in the ‘Track Event’ action, where you can send more info about the event you are trying to send Route from a trigger selected while creating your new Zap. We are working on new features and improvements. But, when you access your account you’ll see that we made available the v.1.0 of our dashboard. We really want to build this dashboard user-driven, and I’d like to hear from you what kind of stats you’d like to see in this area.